Species anise hyssop and golden cultivar. 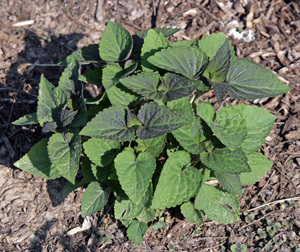 Anise hyssop, Agastache foeniculum, is a short-lived herbaceous perennial with blue flowers and fragrant foliage that can be used as an ornamental or in the herb garden. Native to prairies, dry upland forested areas, plains and fields in the upper Midwest and Great Plains into Canada (from northern Colorado to Wisconsin and in Canada from Ontario west to British Columbia), this plant in the mint family (Lamiaceae) is hardy in zones 3 to 8. 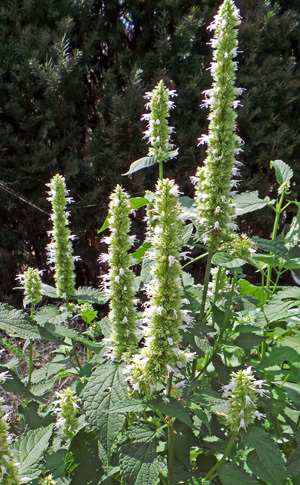 Anise hyssop has an upright form. 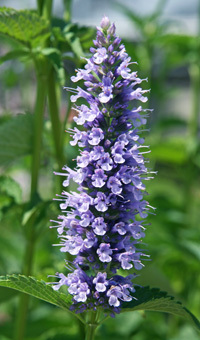 Other common names include blue giant hyssop, fragrant giant hyssop and lavender giant hyssop. Despite the common name, it is not closely related to hyssop (Hyssopus spp. ), a European plant traditionally used as a healing herb, or anise, Pimpinella anisum, a completely different plant in the carrot family (Apiaceae). The new growth often has a purplish cast. The upright, clump-forming plants generally grow 2-4 feet tall and about 1-3 feet wide from a small tap root with spreading rhizomes. 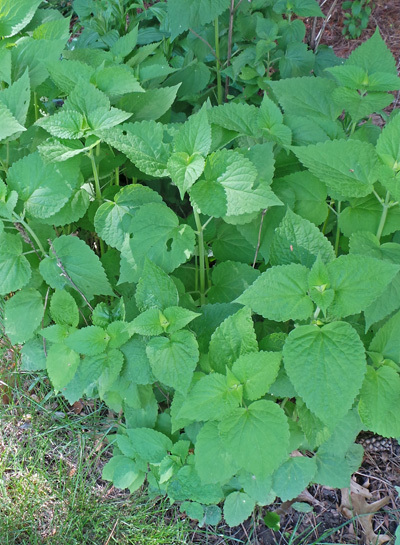 They have alternate leaves on the square stems (characteristic of the mint plant family). The ovate to broad-lanceolate, dull green leaves up to four inches long have toothed margins and a whitish tint to the underside. The foliage remains nice looking throughout the season and sometimes has a purplish cast on the new growth. The medium green, alternate leaves on square stems have toothed margins. The aromatic leaves have a licorice-like (anise) scent, and can be used in herbal teas, to flavor jellies or eaten fresh in small quantities, such as in a salad with other greens. The dried leaves can be used in potpourri. The plant was used medicinally by Native Americans to treat coughs, fevers, wounds, and diarrhea. The best time to harvest foliage to dry is when the flowers are just past full bloom, as the oil content in the leaves is the highest at that time, but they can be used at any time. By midsummer erect terminal cylindrical flower spikes begin to form and continue blooming through fall. The tiny flowers occur in dense, showy verticillasters, or false whorls tightly packed together, that are 3 to 6 inches long. Each tubular flower has two lips like all plants in the mint family, with the lower lip having two small lateral lobes and a larger central lobe, and four stamens ending in blue-purple anthers and a cleft style that extend from the flower throat. 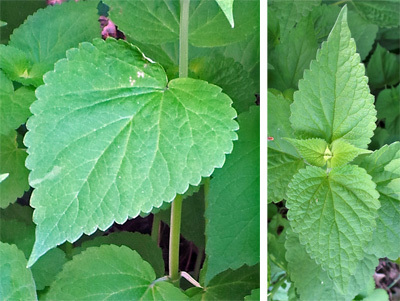 Plant begin blooming in midsummer (L), with erect flower spikes (LC and C) bearing many two-lipped, tubular flowers (RC and R). Flower color varies from white to pale blue and lavender through blue-purple, with the color more intense at the tip. The unscented flowers are very attractive to bees – particularly bumblebeees, butterflies, beetles and other insects that feed on the nectar or pollen, as well as hummingbirds. Pollinated flowers produce smooth, oval-shaped fruit or seeds that are technically nutlets. Deadhead spent flowers to promote additional bloom. The flower spikes can be cut to use in fresh arrangements or to dry, and the flowers are edible. Plants self-sow readily, but undesired seedlings are easy to pull. Goldfinches and other birds may feed on the seeds. The flowers are attractive to many pollinators including bees (L), butterflies (C) and beetles (R). 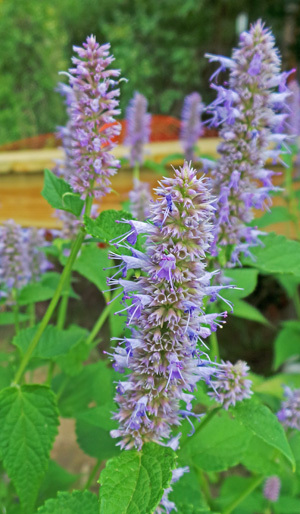 Anise hyssop combines well with many native perennials, such as bee balm. 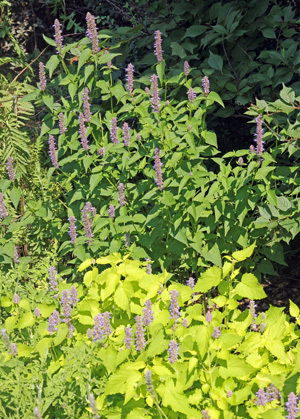 Anise hyssop contrasts well with purple-foliaged plants. purple coneflower (Echinacea purpurea), bee balm (Monarda spp. ), false sunflower (Heliopsis helianthoides) and native grasses. In perennial gardens it mixes well with globe thistle (Echinops ritro), Japanese anemones, Russian sage (Perovskia atriplicifolia), and plants with purple foliage, such as Euphorbia dulcis ‘Chameleon’ or purple-leaved heucheras. 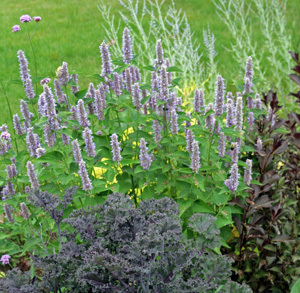 Use anise hyssop in mixed or perennial borders. It can also be grown in containers, alone or in combination with other plants. 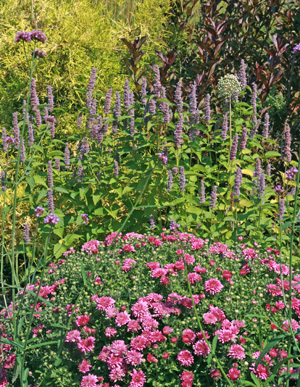 In mixed beds combine it with Verbena bonariensis and various annuals and perennials. 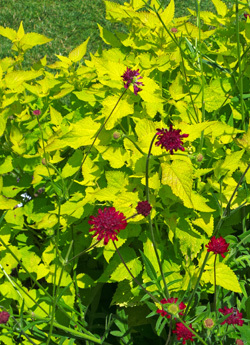 The chartreuse foliage of the cultivar ‘Golden Jubilee’ offers good foliar color contrast with other green- or purple-leaved plants. 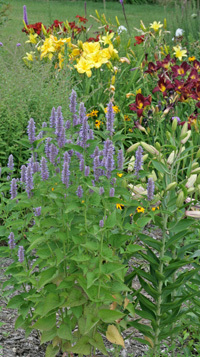 Anise hyssop is tolerant of many soil types and is easy to grow. 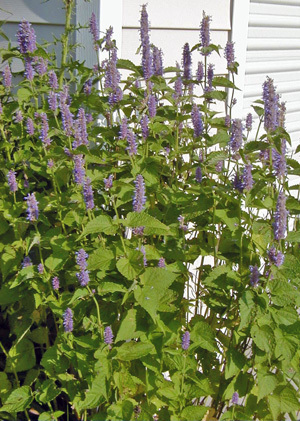 Grow anise hyssop in full sun to partial shade. It tolerates a wide range of soils as long as there is good drainage. This plant has no significant pest problems, but may develop root rot in wet soils or powdery mildew and leaf spots in humid climates. It tolerates drought once established but will also do well in moist soils as long as it has good drainage. It is not favored by deer but rabbits will eat this plant. 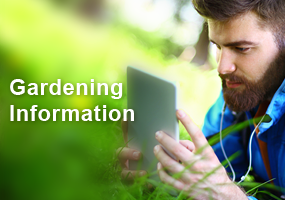 It is easy to grow and rarely needs staking. 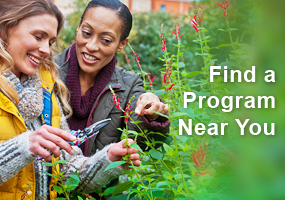 Plants grown from seed may bloom the first year. 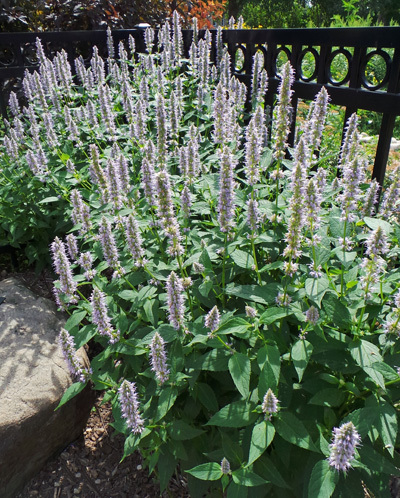 Anise hyssop is easily started from seed and often blooms the first year, but also can be propagated in spring or fall by division of plants that spread by rhizomes. Seeds need light to germinate, so barely cover the seeds. They should germinate in 1-4 weeks; cold, moist stratification improves germination. Self-sown seedlings can be easily transplanted when small; although they will wilt quickly when moved, the plants will recover in a few days. To collect seed, allow the flower spikes to dry on the plants and bag the spikes to capture ripening seed or remove from the plants to collect seeds. Sterile hybrids are propagated by semi-ripe cuttings taken in summer. ‘Alabaster’ – has creamy-white flowers on three foot high plants that have lighter green foliage and are not quite as bushy as the species. ‘Black Adder’ – is a hybrid with dark buds and red-violet flowers, but is less vigorous than the species. ‘Blue Blazes’ – a tall hybrid of A. foeniculum and Agastache ‘Desert Sunrise’ introduced by High Country Gardens that has pinkish calyxes and glowing lavender purple blooms. Hardy to zone 5. ‘Blue Fortune’ – a sterile hybrid of A. foeniculum and A. rugosa bred at Arboretum Trompenburg in Rotterdam, Netherlands. It has extremely thick spikes of powder blue flowers and large, deep green leaves. 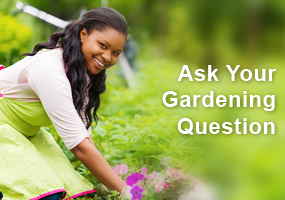 Plants grow to about 3 feet tall and 18 inches wide. Peak bloom is in midsummer and flowers last a very long time because it sets no seeds. It received the Royal Horticulture Society’s Award of Garden Merit in 2003. ‘Blue Fountain’/’Blue Spike’ – has clear blue flowers. ‘Golden Jubilee’ – an All American Selection Winner (2003) with golden-chartreuse to lime-green foliage that is especially bright yellow in spring and normal lavender-blue flowers. Self-seedlings are mixed with some golden ones. ‘Red Fortune’ – a hybrid with pink flowers that are not nearly as attractive to pollinators as the species. ‘Snow Spike’ (also known as ‘Album’) – with white flowers on three foot plants. Anise hyssop is one of my favorite pollinator plants. It is an absolute pollinator magnet! It is very easy to start from seed but requires a 30 day cold moist stratification period prior to germinating. As stated in the article, deer don’t bother it. I was not aware that rabbits were fond of it but, with as many of these plants that I have, I probably would not notice if a few had been consumed. I was not aware that there were so many cultivars of this plant. Some appear quite beautiful. However, whenever I help individuals establish pollinator gardens, I always suggest that they use the native varieties rather than cultivars since the cultivation process frequently alters that pollen and/or nectar value of plants. 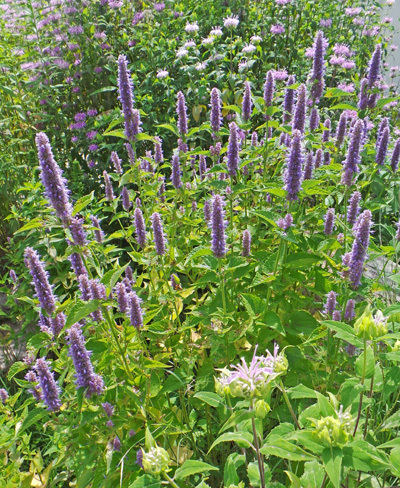 Is Anise hyssop a good color combination with Stargazer lilies? If so, how far in front of the lilies?